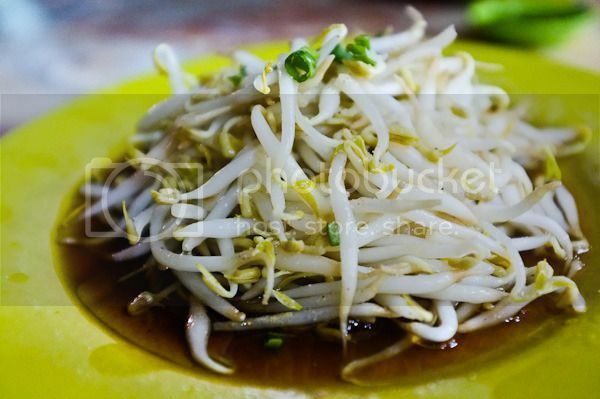 If you mention any popular spots for ‘nga choi kai’ (bean sprout chicken) to the locals, they will probably cringe at each name you are going to utter. And they will probably show you the ‘talk to the hand’ sign in order for you to stop talking. Or maybe they will ignore you for the good of humanity. I got to know this stall via a photo post in facebook and it was advocated by a friend of mine who is an Ipohian. It’s the same person who introduced to me Keng Nam Coffee Shop. As they say, the locals know better than the tourists which is probably quite true as we found out that this stall offers no frills, simple yet delicious ‘nga choi kai’. Insanely crowded are probably non-existent words to describe this place as most of their customers are of the locals and very little few are tourists. Despite that, securing a seat during peak hours is still a challenging task. The tables and chairs are as what you get from typical old school food courts; a mix of round and square aged plastic tables and variety of old chairs. As for ordering system, just grab a place and a waiter will attend to you shortly. 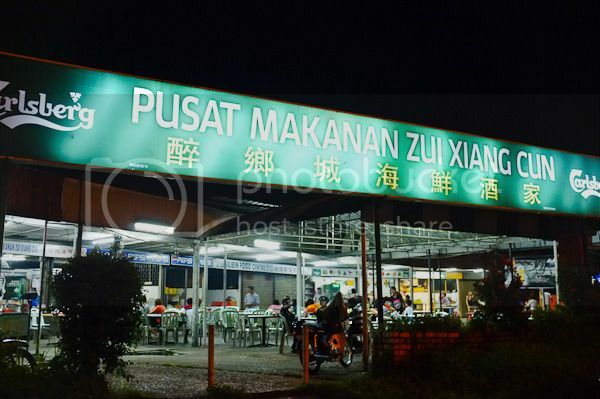 Just like Restoran Cowan Street Ayam Tauge & Koitiau, they only serve flat noodles (kuey teow); dry or soup. 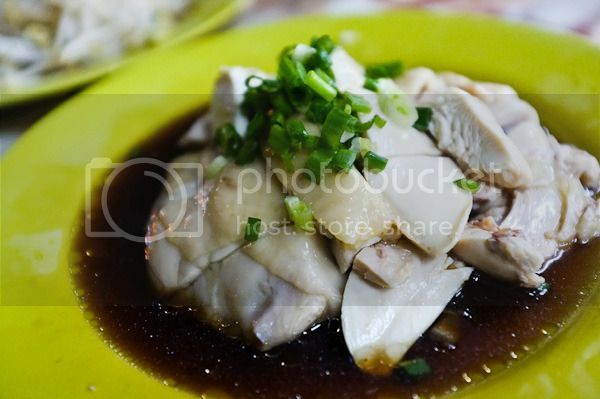 Poached, sliced and drizzled in a concoction of soya sauce and oil, the chicken meat was firm yet retaining its essence and juices even for chicken breast. The plump, crunchy bean sprouts were blanched before being drizzled in the same mixture as the poached chicken. 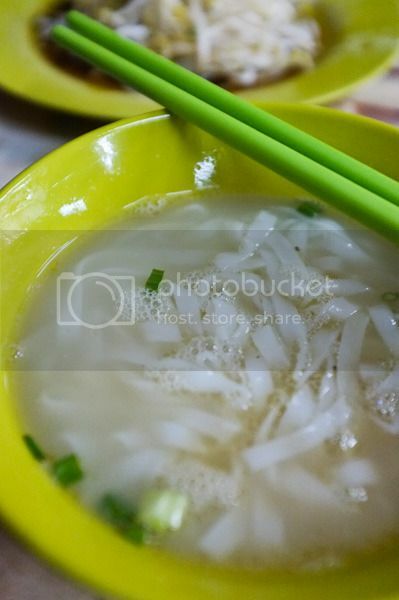 The bowl of silky smooth flat noodles (kuey teow) was just a-okay because the soup was wee bit lacking. The total bill for the meal above was RM9 for 2 pax. Pretty cheap I guess judging by the portion and number of items. 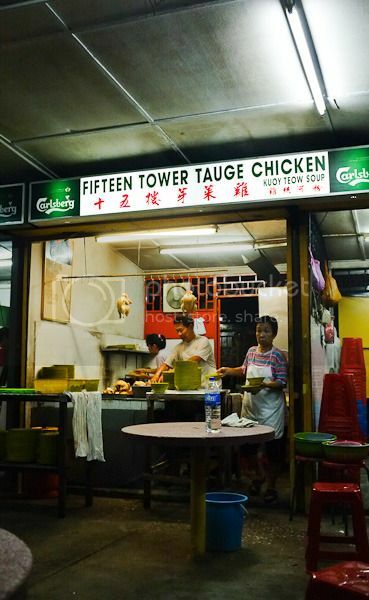 There is a satay stall nearby but we did not get try because he was busy attending to large orders at that moment. We shall return again to try it while waiting for our comforting ‘nga choi kai’ meal.